Transmission « Global Market Insights, Inc. 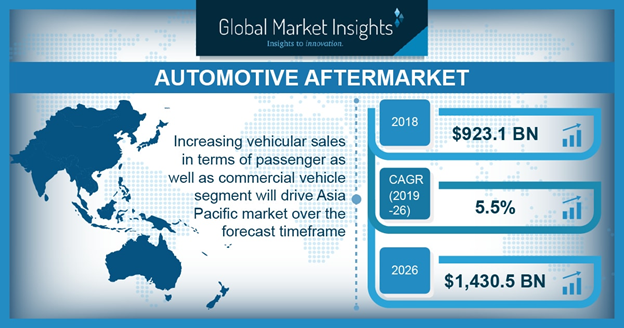 It is prudent to mention that a strict regulatory framework toward carbon emission abatement across emerging economies has left an inexorable impact on authorized car service center market outlook. Recently, the Maharashtra Pollution Control Board has issued a notice against a dealership and car service center for violating the environmental norms. Following a complaint with regards to unscientific disposal of waste water, the board had officially conducted an on-spot inspection and found that the ETP (effluent treatment plant) of the workshop was not operational. These kind of pitfalls in unlicensed service centers have in a way provided a lucrative growth avenue to authorized car service center market. Presence of advanced machineries in tandem with skilled technicians has further stimulated the market outlook. 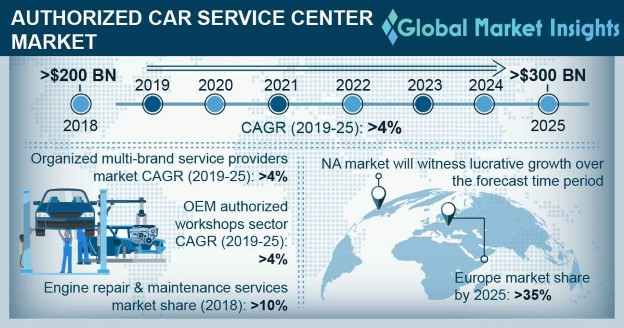 Primarily grounding on three major rationales- appropriate business model, cost-effective services, and decent attitude of the service advisors, authorized car service center market is slated to witness a slew of opportunities in the coming years. 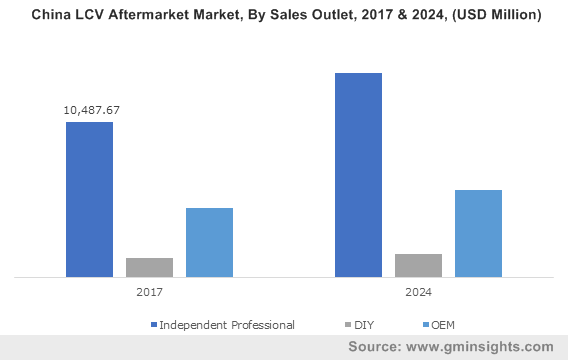 In terms of commercialization, the fraternity is forecast to surpass USD 247 billion by 2024. This entry was posted in Automotive & Transportation and tagged Authorized Car Service Center Market, Authorized Car Service Center Market Report, Authorized Car Service Center Market Size, Authorized Car Service Center Market Trends, Auto Body Workshops, Body, Brakes, Electrical, Engine, OEM Authorized Workshops, Organized Multi-brand Service Providers, Services, Suspension, Transmission, Vehicle Age. 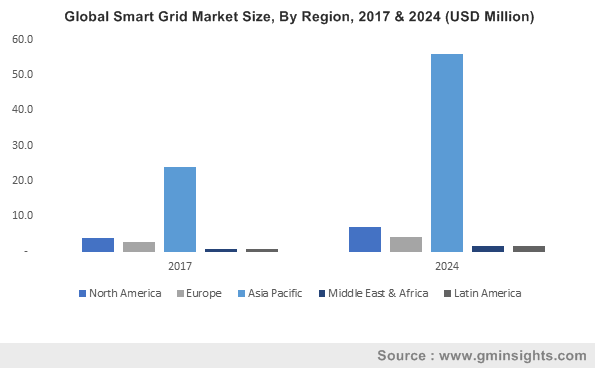 In the recent years, smart grid market has earned substantial revenue due to the increasing awareness about the incredible benefits provided by these products. In addition, this vertical has also received quite some impetus on account of the rising requirement of power grids that can accommodate and support increasing numbers of electronic devices in each household. The importance of smart grids has been recently upheld by the city council of Sault Ste. Marie in Canada when a multi-million-dollar implementation of smart grid technology was cleared. Authorities managing the development of the project assured citizens that the upgrading to smart grid will have no financial, reliability or environmental drawbacks. In fact, it would bring about a 11-cent reduction in the monthly energy bills and drastically reduce CO2 emission to 2,804 tons annually within the city. As the disasters caused by rapidly incremental climate change have plagued the news headlines of late, investment in the smart grid industry in the United States has also registered a cumulative upsurge. In 2017, U.S. smart grid market was valued at $3 billion. Recently the Massachusetts Department of Public Utilities issued an approval for significant upgrade in the state’s electric grid. The order authorized utility companies of the state to invest $220 million in the modernization of the existent grid. The improvement project, which is expected to improve reliability and efficiency, will require 3 years for the upgrade. Agencies with environmental interest such as Energy and Environmental Affairs of U.S. have acclaimed the order to be a recognition to the role advanced meters and smart grids play to reduce costs, increase energy efficiency and maximize clean energy generation. The grid modernization investments will automate the process for improved visibility of mechanical equipment, creation of a self-healing grid and automated command and control. These improvements will help reduce power outages and improve the process of storm restoration, as well as enhance the utility companies’ ability to integrate distributed energy resources onto the electric grid. The success of the modernization is expected to encourage such investments in other states as well thus contributing to the expansion of the smart grid industry in the United States. Similar efforts are also in motion in Europe where the EU is aiming at replacing 80% of the electric meters with smart meters by 2020. In a recent venture, EU and China have released a joint statement with the intention of exchanging potential innovative and legislative solutions to meet the global demand of clean and green energy alternatives. Both China and EU agreed that improvement of energy supply security will enhance energy efficiency, support switching to low carbon energy sources and increase the share of renewable energies. According to findings presented by the European Commission, China and EU consume 22% and 12.5% of the global energy respectively and both are trying to break the dependence on fossil fuel imports. To achieve this goal, increasing the share of renewable energy sources and upgrading the potential of smart grids has been mentioned to be pivotal, pointing towards the increase in investment in the smart grid industry over the coming years. The smart grid market is being predicted to perform well in these regions as EU is currently drafting a 2050 decarbonization strategy and China has committed to bring down its carbon footprint by setting carbon reduction goals and other renewable targets to be met by 2030. Speaking about China’s investment in the smart grid industry it will be prudent to mention that other Asian countries are also recognizing the potential of a smart grids. Indeed, APAC smart grid industry is estimated to grow over 12% over 2018-2024. Citing an instance, the Indian government recently announced that it would develop a smart grid project in the financial and technological hub near New Delhi, Gurugram. The underground smart grid is expected to be completed by 2022, saving 120-150 MW of electricity every day and solving the long-standing issues of power theft and technical faults. A software-based technology will be used to replace manual maintenance in all low-transmission (LT) lines that will be located underground. The underground placement of the lines will potentially curb pilferage and theft that has been impairing power supply by almost 20%. The incidence provides apt evidence that India smart grid market is poised for a bright future. Smart grids add monitoring, control, analysis and communication capabilities to electrical delivery system while reducing energy consumption. Utilities also benefit from smart grids as it allows them to move electricity around the system more economically and efficiently. Smart grids are also positioned to take advantage of new technologies such as hybrid electric vehicles, smart metering, distribution automation and solar energy. As governments look to optimize the operation of the entire electrical grid, increased smart grid deployment will be witnessed across the globe. As per reliable estimates, smart grid market is anticipated to surpass $70 billion by 2024. This entry was posted in Sustainable & Smart Technologies and tagged Advanced Metering Infrastructure, Communication & Wireless Infrastructure, Consulting, Consumer Interface, Deployment & Integration, Distribution, Distribution & Network Automation, End-Use, Generation, Global Smart Grid Market, Smart Grid Market, Smart Grid Market Forecast, Smart Grid Market Growth, Smart Grid Market Outlook, Smart Grid Market Report, Smart Grid Market Research, Smart Grid Market Share, Smart Grid Market Trends, Smart T&D Equipment, Support & Maintenance, Transmission, U.S. Smart Grid Market.